Introduction: Ireland’s early books are interesting both in and of themselves and as cultural artifacts. The following pages present an archaeological exploration of those books. An outline of the development of the script used will show that handwriting is a particular sensitive reflection of the culture from which it springs, and that it sometimes tells us things about the culture which we can no longer learn from any other source. But first we must consider a preliminary problem, that of finding the books to discuss. For, unhappily, manuscript books from early Christian Ireland are quite rare. Indeed, in the period before 700, only four manuscripts claim pure Irish parentage: a set of waxed tablets found in Springmount Bog, Co. Antrim, a fragmentary psalter known as the Cathach or “Battler” of St. Columba, a liturgical book known as the Antiphony of Bangor, and a copy of Adamnan’s Life of Columba. 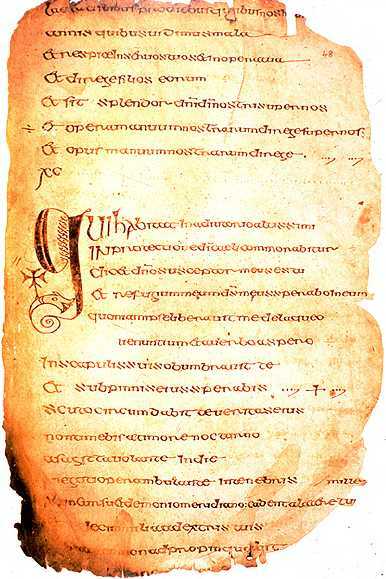 It seems clear that Irish scribes living in Ireland wrote each of these four manuscript, but four is a very small number. Were scribes very scarce before 700 in Ireland?